So, we got a pretty solid episode, and quite a bit of set up for Legends of Tomorrow in last night’s Arrow. (And a special guest appearance by one of my favorite minor characters!) Spoiler’s ahoy! We first get a flashback to Ray Palmer’s past instead of Ollie’s, which is a nice change of pace. We see him running ‘miniaturization tests’ on his suit. 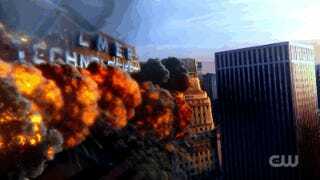 An explosion happens while he’s adjusting it and we see him and the suit scatter in the blast. In present time we see Ollie and Thea working with Alex Davis on Ollie’s mayoral campaign platform. In passing we learn that Felicity has been spending a lot of time lately at Palmer Tech, supposedly because she’s taking her role as CEO seriously, which means she hasn’t yet told Ollie that Ray is alive and she’s trying to save him. After Ollie leaves Alex suggest that he and Thea get out the fancy restaurant that they’re planning on hosting a banquet at. Thea declines, as her life is complicated, but definitely feels like they left the door open for the future. Then we see that Felicity is hard at work at Palmer Tech, working hard to find the origin of Ray’s message. Curtis tries to intervene saying she needs to take care of herself too, as she’s clearly over stressing the situation. Ollie arrives, and then Felicity does tell Ollie about Ray, and plays the message for him. Ollie insists on Felicity taking care of herself as well, starting with a shower and a nap. Ollie wants to help, but there’s little he can do since he’s not a tech savvy. 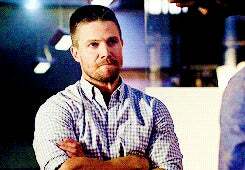 Then Felicity gets an alert, and then they get to video chat with Ray. He tells them he’s being held captive, that his suit is damaged and he can’t blast his way out, and that he’s shrunk. Then Felicity’s mother arrives. Apparently Ollie is the one that suggested her to visit. Felicity insists her mother return to her place to rest after the flight, Curtis starts building the machine, and that she will figure out a way to get their missing piece of equipment. We see the team gearing up for the mission. The team includes two canaries this time though. Ollie gets in a turns off the alarm with a code from Felicity. The cameras come back online quickly, but it also means that they’ve likely got a quicker response and their guards catch them. Sara goes a bit overboard with overpowering the guard, causing concern by everyone. They all get out safely though. Then back at the Quiver, Felicity gets another message from Ray. That’s when we see who is holding him captive before the feed goes dead: Damien Darhk. OTA has a quick meeting where they work out the plan for saving Ray. They decide to use Lance to try to figure out where Darhk is keeping him. Felicity doesn’t like waiting. Both Ollie and Diggs say that she needs to take the time to take care of herself, starting with a nice dinner with her mother. Darhk takes a moment to talk to Ray about his situation. He threatens Felicity in order to try to coerce Ray into cooperating, since he own men are unable to figure out how to unshrink him. 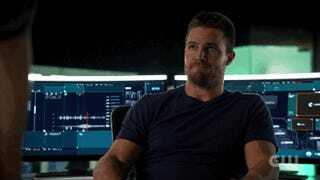 Ollie tells Felicity that he doesn’t like being shut out, and that it feels like Felicity is blaming him. Felicity says she blames herself, because she was living a happy life with Ollie when Ray was sending her distress calls. Tensions between the two of them rise as Felicity implies that isn’t the type of girl to do what she did and lose herself in a guy. Ollie says he will give her space until she figures it out, and leaves. Ollie heads to the Quiver, and is joined by Diggs. They share a drink as Ollie confines in Diggs what had happened. 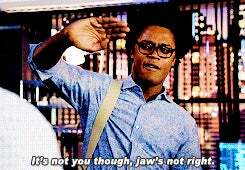 He’s starting to wonder why Felicity chose him over Ray when it’s clear that Ray and her have more in common. Diggs is a love guru and not only reassures Ollie that him and Felicity have something real, but that it will work out in the end. Then they get the alert about the meeting between Lance and Darhk. Lance says that Sara is back, but not all the way, and he wants to be of use to Darhk so Darhk will help him with the “Magic Mumbo Jumbo”. Darhk is insulted and leaves, with Diggs following. Mama Smoak comforts Felicity. She tells how she lost herself in Felicity’s father, and that Felicity isn’t her and isn’t going to make the same mistakes. Mama Smoak gets through to her, saying Ollie really loves her and that’s something to hold on to. Then she gets the alert for the team meeting. In the Quiver, the whole team is there as Felicity briefs them on the building Diggs followed Darhk to. Given the security surrounding the place, they don’t think they’d be able to go in and extract Ray. Ollie suggests that Curtis assembles the device in the field and re-size Ray on the inside. Sara wants in, and despite the reluctance given what happened last time, the team agrees. They get into position, but Green Arrow is taken out before they even get into action. He’s taken hostage and Darhk takes the chance to interrogate him. Except, that was part of the plan as everyone else is ready and in position and put their real plan into action. A plan that starts with Felicity and Curtis base jumping into the building. Darhk goes to remove Green Arrow’s mask, but he does a jumping kick to the face and breaks free of his chains. He snatches up his bow and arrows, but Darhk easily deflects them and magically controls the chains to wrap around his neck. Green Arrow uses some type of explosive arrow to blind Darhk long enough to escape. The rest of the team fight’s Darhk’s men and find Ray. Curtis and Felicity do their thing, Ray gets into his (now functional) suit, and they return him to normal size. As the team is fighting their way out, Sara goes a little overboard again, snapping the neck of one of the guards. Green Arrow rejoins the team and they all get out of Dodge. Ray recounts what happened after the explosion. OTA fills him in on Darhk and what he’s been up to in Star City. 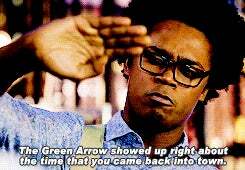 Ray also tells Felicity that they overheard his message to her, and that she might be targeted in the future. Felicity said she guessed as much and, with a very knowing look at Ollie, says that she can handle it. Ray decides he doesn’t want to come back from the dead just yet, leaving Felicity in charge of the company still. Thea and Laurel try to comfort Sara about the struggles she’s having with the bloodlust. Sara says she isn’t a great at fighting it as Thea, and that she needs to get away for a while and figure out what works for her. Her first stop is to visit their mother, in Central City. Felicity and Ollie clear the air between them. Felicity starts with thank Ollie for how he handled her freaking out. They reconcile, and kiss, and more than kiss. Lance is having a drink alone, when Mama Smoak starts talking him up. They summarize their problems to each other in a way that doesn’t imply anything supernatural. They have a cute moment, implying they might be forming a relationship. Back at the office, Thea decides to take the plunge and ask out Alex, wanting to have something normal. Darhk’s science guy fills him in on what they were able to discover following Ray’s escape, namely that they were able to recover residue from Ray’s Dwarf Star alloy and turn it onto a power source. A power source that Darhk wants him to test out on something specific. Ollie leads jerk face #1 and jerk face #2 to the place Constantine showed him before. Jerk face #2 has something that glows and kind of reminds me of a dragonball. When the dragonball like sphere comes close to the ‘barrier’ we see hieroglyphics that also light up, supposed left by the ancients. Jerk face #2 decides to send Ollie and some of the workers to a cove to find a ‘gift’. Ollie gets them to the cove. Jerk Face #1 pretty much tells Ollie he’s suspicious of him, and approaches one of the soldiers. Ollie breaks away to go see the woman he saved. The guy jerk face #2 spoke with then tries to kill Ollie, who kills him in self defense. Jerk face #2 doesn’t see it that way though. I mused last week that they’re might be a connection between the Orb of Horus and Hawkgirl, now I’m wondering which ‘ancients’ they’re looking into here. Ray likes bugs. Kord Industries. They sure love their Easter eggs. It was odd seeing Sara use a gun in the field. Curtis was pretty fun to see in the field. Seriously, is there something more about Alex Davis that we don’t know yet? 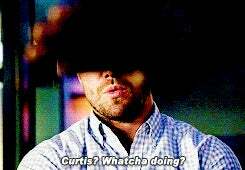 I love Ollie’s dorkiness this season, with cooking and texting Donna and stuff.